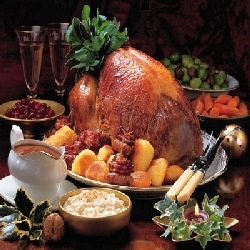 On Christmas Day or Christmas Eve, it is customary for most families to get together for that special traditional Christmas dinner. Considering that for much of the season, we have been very busy buying gifts, wrapping them, writing greeting cards, and so forth, come Christmas dinner time, we take pause, sit back a while and, yes, engage in actual conversation with our family and, occasionally, a few invited guests. At Christmas dinner, we break bread together, so to speak, as a gathering of people who really ought to care for one another. As we eat together, we take stock of what has come to pass and what may be in store for the family the following New Year. Given the realities of modern living, when getting everyone in the family together for a meal is quite often impractical, we really should take full advantage of that rare Christmas dinner. In that one day of the year, make sure that nothing else can get in the way. So, if you’re visiting, turn off your phones, leave your work behind, and help out with the cooking and the chores. If you’re hosting, make sure that you serve something truly worthy for the occasion. Now, what does the traditional Christmas dinner comprise of? That depends on your family’s cultural roots. For most Americans though, it is traditional to have glazed ham for Christmas dinner. Typically, the kinds of ham you can now find in supermarkets are almost always fully cooked already, ready to serve after just a few minutes of heating. You can buy bone-in, boneless and spiral sliced hams. 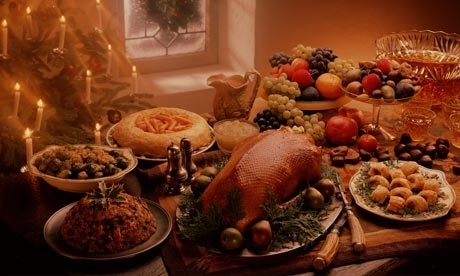 For other families, in lieu of ham as centerpiece for that special sit-down meal, they have stuffed roast turkey, duck or goose, or roast beef, lamb or mutton. Those in the rural regions even have game meat like quail or elk. Side dishes and dessert to complement the main course include pigs-in-a-blanket (tiny sausages wrapped in bacon), corn-on-the-cob, roasted brussel sprouts, mashed potatoes with gravy, green bean casserole, broccoli with butter, squash, cheese, plum pudding, apple or pumpkin pie, fruitcake, assorted nuts and sweets. Traditionally, we have eggnog or hot buttered rum for Christmas dinner although it is now common for many to also serve beer, wine, brandy, whiskey and other liquor to liven up the conversation at the dinner table. The Christmas dinner tradition may or may not have its origins in ancient Rome’s Saturnalia, a festival of orgies and excesses. However, fact is, come Christmas dinner time, we are really expected to have a feast. So, don’t spoil the fun. Forget about the diet for a while. Eat, drink, be merry. Enjoy the company and of course the food.